Googling "Agenda 21, the Green Movement, UN and the Communists" is very revealing. Agenda 21 spreads it tentacles from Governments, to federal and local authorities, and right down to community groups. April 1991, fourteen months before Earth Summit, Prince Charles held a private two day international conference aboard the royal yacht Britannia........... Al Gore was present, along with senior officials from the United Nations and the World Bank. At the summit 179 nations officially signed Agenda 21 and many more have followed since. The official opening ceremony was conducted by the Dalai Lama and centered around a Viking long-ship that was .........appropriately named Gaia. Maurice Strong, Club of Rome member, devout Bahai, founder and first Secretary General of UNEP, has been the driving force behind the birth and imposition of Agenda 21. Communism did not die behind the Iron Curtain in 1989 – it re-emerged in a more nefarious form around the globe, promoted by the compliant media and hypocritical Hollywood. McCarthy was right about some of them after all. The has-beens of the old communism and total government control are nostalgic for the good ole days of totalitarianism, romanticizing the past, trying to reclaim their positions of power and privilege. The global communism of U.N. Agenda 21 is making great strides, using environmentalism, land preservation, zoning, and care for the planet as a tool. And the Fabian socialists in the west are winning the hearts and minds of low information voters who believe anything they are told over and over by the mainstream media. 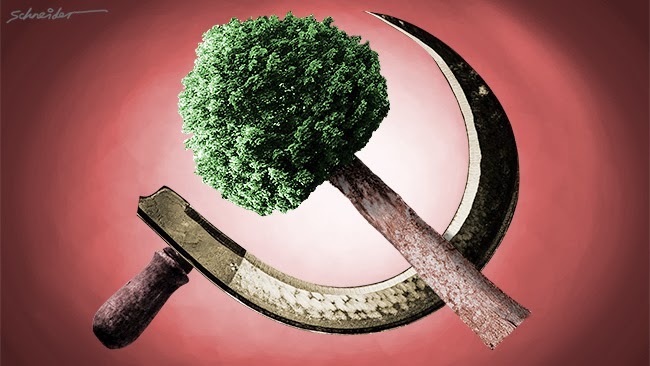 This blog has recorded (LINK) that Greenpeace Co-Founder Patrick Moore noted that the collapse of Communism led to Communists entering the Green Movement. Obama was blindly sticking to the simple Marxist theory … ‘there’s going to be a revolution.We need to be organized and grow the movement. Speculation is running strongly that Brown's departure was directly linked to the intensifying power struggle between the environmental wing of the Greens and the increasingly influential bloc of former communists, socialists and members of other hard-left groups, including NSW Senator and former Moscow loyalist Lee Rhiannon, that has formed in the party over the past decade. At Murdoch University, Bandt was a student activist and member of the Left Alliance. At that time, he was quoted as calling the Greens a "bourgeois" party.3 In 2008, Bandt completed a Ph.D. in law and politics from Monash University, with his thesis on Marxism. Without Brown, the far left and extremists will steamroll over the others and become the new reigning force within the Greens. These members include the now Deputy Leader, Adam Bandt, a self-identified former member of the Left Alliance that once admonished ultra-left groups such as Resistance and the International Socialists for not being left-wing enough. Bandt has referred to the Greens as a ‘bourgeois party’ that can be used as a Trojan horse for pushing an anti-capitalist, socialist Marxist agenda. He has identified the Greens as the best avenue to achieving socialism in Australia. Senator Lee Rhiannon, who has long-standing ties with far left and Marxist organisations, has also played a role in pushing the Greens further and further to the left. She has led the Greens’ push for an anti-Israel boycott, and has openly supported the Boycott, Divestment and Sanctions movement, one of the many issues that has divided the Greens party. A former member of the Communist Party of Australia, she once argued that the Greens respresents the closest to the best of the CPA’s politics and methods. Any voter thinking that the Greens are nature-loving, tree-huggers should do some re-thinking. Anyone thinking of voting for the Greens should examine their policies. See Greens Policies Global Governance. The system of global governance must be reinvigorated to advance global peace and security, justice, human rights, poverty alleviation, health and environmental sustainability. A vote for the Greens is a vote against your country's self-rule. Governments need something to keep the people afraid, initially it was the sword, but more civilized recently to things like "the yellow peril" and "reds under the bed" then the cold war and the threat of nuclear destruction. Global warming or climate change is the latest tool that governments can use to control the masses, feed them a string of lies and they will be happy to pay extra for fuel, power, water, everything to keep the planet from dying, but all it is doing is giving the government control and re distributing the wealth. Why does a "rich" country like Australia pay a carbon tax, but poor countries don't? Agenda 21. And it is both sides of politics that use this deception, it is one of the keys to the power they so eagerly seek. You're on the right track, but pulling the wrong threads. Our opponents are NOT "communists," or "Marxists." Our opponents are Politically Correct Progressives. While my work focuses on the US, the same operations were waged against Australia--simple substitute "Australia" for "America" in my comments below. The terminology is precise. "Political Correctness" is a belief system based on the fundamental tenet: "America is a racist, sexist, foreigner-hating, imperialist, capitalist hell-hole. And it must be changed." That is what our opponents believe. In short, PC-Progs are "anti-Traditional-America." They are only "for" something if it is against traditional American values, beliefs, or laws. How could Americans have developed such a belief system? Did these suicidal beliefs just spring up from nowhere? Or were they introduced, nurtured by an outside force? If so, who? When? How? These were the questions I had when I started my research in Political Correctness. They are answered in my book: "Willing Accomplices: How KGB covert influence agents created PC, Obama's hate-American-first platform, and destroyed America."